This is a decent Pop-Tart... if you know what you're getting into. The "Blueberry Muffin" name is misleading. A much more apropos name would be "Blueberry Cream Pie Pop-Tarts". While most toaster pastries have a jam-like filling, this Pop-Tart has a cream or custard-type filling with specs or streaks of "blueberry". While you won't taste much in the way of "muffin" flavor, this pastry does deliver on blueberry flavor. In fact, the creamy filling serves to offset the berry flavor producing a lighter, softer blueberry flavor. When it comes to sweetness, this Pop-Tart created conflict in our office. I was of the opinion that this pastry had just the right amount of sweetness... anymore would have killed this Pop-Tart... ramrodding it into the realm of "just too sweet for breakfast". Another associate in the office thought that Blueberry Muffin Pop-Tarts were too sweet, saying, "Wow, this is so sweet. I don't want to finish it." However, I should mention that same associate said, "It's a pretty Pop-Tart." Specks of "blueberry" and a sort of sugar-crumb topping embedded in the white frosting does make this an attractive product. In the end, I kind of like this one. It was flavorful and fun. However, when you weigh nutrition against flavor, I'd recommend any of Kellogg's 20% Fiber Pop-Tarts over this one. They taste just as good and offer a token amount of nutrition. Nutritional Considerations: Each single pastry serving has 200 calories, 5 grams of total fat (1.5 grams saturated fat and 0 grams trans fat), 0mg cholesterol, 200mg sodium, 35 grams total carbs, less than 1 gram dietary fiber, 16 grams sugars and 2 grams protein. 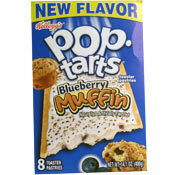 What do you think of Blueberry Muffin Pop-Tarts? 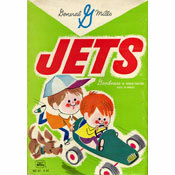 This one is my absolute favorite Pop-Tart flavor but I can NEVER find it anymore. I miss it so much. I disagree. Compared to other Pop Tarts, this is not as sweet. It's one of my favorites! This poptart is my second FAVORITE poptart ever. Taste like a Dunkin Donut blueberry muffin, sooooo yummy. I wish I had one right now.! I thought it was awesome and for those who think it's too sweet, have it with a glass of milk! The flavors mellow out so nicely, it's orgasmic. I loved the blueberry muffin pop tart. The inside reminds me of the batter before baking real blueberry muffins. So I thought it was a nice change from the gel filling in all other pop tarts. Kind of makes them not as sweet as the others in comparison. I was told about these by a co-worker and she loves them even more than I do. So 2 happy consumers love this product. Mmmnnn, these Pop Tarts rock! This Pop Tart is AMAZING! I love to sample a little Betty Crocker blueberry muffin dough when I make them so I thought this might be good. Unfortunately it tasted like warm liquid blueberry muffin dough and after one tart I really didn't wanna finish the second one. I'll just stick to either the blueberry muffins themselves, or the regular blueberry poptarts - not the combo. I thought these were okay. My kids thought they were awful, and hated the streaky-looking purple color of the filling. On the upside, the Kellogg's people were nice enough to send me a sample, so I had no out of pocket or leftovers. These are so good I hope they stick around for a while. Delicious toasted!! Great for breakfast! Yummm! I love all Pop-Tarts! I'm eating these right now as I type my review. I like the strong blueberry flavor, but I have to agree with Joanna in wanting a more tart flavor like my favorite Cherry flavored Pop-Tarts.